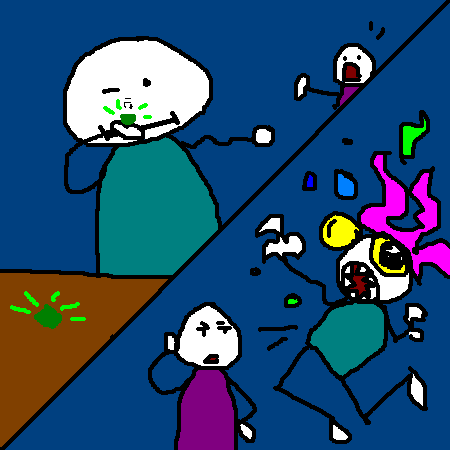 Yeah, you shouldn't have snorted that green glowing stuff. Stop! Don't pick your nose and eat it. Oh. Too late. Now you're a crazy clown. Stop! It is forbidden to pick your nose, or your mouth. At 12:10, female sheep will morph into Krusty the Klown in a straight jacket. If Ann COulter and Rosie O'Donell stop picking their noses, perhap, with time, we can finally drive Krusty the Clown insane with female sheep. Molesting the sheep gives you the bad game over screen and only leaves you with a score of 8800. What was with that last picture? Hell, I thought it was funny. Im sorry Processor... just... what?